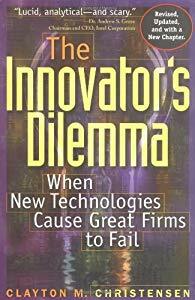 Steve Jobs popularized The Innovator's Dilemma by Clayton Christensen in his biography. As far as business books go, it's a demanding read. It explains how the most successful businesses in an industry are constrained to the point where they can't successfully launch disruptive technologies. Instead, smaller, more agile competitors are better poised to take the lead in that arena. When I first opened the book, I expected an Alta Vista or a Lycos to be featured. These were some of the early popular search engines replaced by Google. Instead, the author begins with Sears! Sears is struggling badly now. At one time they were the gold standard for a well run business in the U.S. They had the best store concepts, the best products, and the best management. Yet, because of the constraints success in existing markets forces on successful companies, Wal-Mart was able to launch the disruptive technology that has rendered Sears almost obsolete. Companies depend on customers for resources; therefore these customers have a large say in the decision making within the established company. Established companies need to maintain their position within their existing markets. Small markets, which provide the opportunities for disruptive technologies, don’t solve the same growth needs of large companies. Emerging markets which don't yet exist cannot be predicted. Therefore the market analyses established companies are so good at doing is not relevant. What happens then is that established companies are trapped by their current market success and their decision making does not allow them to place a significant priority on creating new markets through disruptive technologies. This creates the opportunity for smaller emerging companies to leapfrog the established firms. Think of how Google jumped over the bigger players in the search engine market. What are the established companies to do? The Innovator's Dilemma suggests they either establish a separate company which can serve as the innovation arm, or partner with companies who can innovate for them. Many companies have begun to explicitly build in "tinkering time:" company time where their staff can basically play with new ideas and hopefully come up some market-moving innovations. This approach has some question marks as well (see The Trouble With Tinkering Time from the Wall Street Journal). The Innovator's Dilemma is written from the large incumbent's standpoint. It provides advice and strategies for large companies to recognize and deal with this very significant threat to their position. Now what we need is the guide for the up-and-comer. If the large incumbents are vulnerable and small, aggressive, ambitious companies are better poised to create new markers through innovative technologies, what can the little guy do to take advantage of this opportunity? Product competition proceeds through four phases: functionality, reliability, convenience,and finally price. Be sure you have great functionality with an eye toward succeeding with the other three attributes. Disruptive technologies are typically simpler, cheaper, more reliable, and convenient than established technologies. Established firms waited until their product innovations were suitable for their existing market or a known market. In contrast, the emerging companies did not wait and instead created a new market for their product. These markets started small, which made them unattractive to the incumbent, but allowed the innovators to first get established and then to move up market. If you are an innovative company feeling you have an idea or product that can knock off the incumbent, these attributes of disruptive technologies are important to be aware of. The other thing I would recommend is to bear in mind there are no rules of business which ensure the exiting behemoths will always be there. Sears was once the best company around; Wal-Mart didn't even exist when Sears was in its heyday.